So Thom Brown is going all diffusion and grey on us… Thom Grey is going to be 40-50% cheaper that its Brown counterpart. 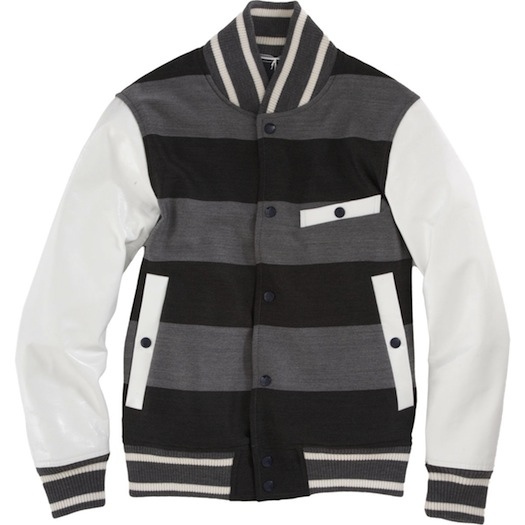 One of the first garments to emerge is this Stripped Varsity Jacket. It features grey and charcoal strips on the wool body, white leather arms, a snap button closure, three white slit pockets with snap finishes, large Grey logo on the back…jury is still out for me, think it looks a lil Jack Wills! !